In the game “Walks” the child can improve gross motor planning and eye-hand co-ordination skills. The child becomes a Farmer who walks along a path that has specific shapes, i.e. horizontal, vertical, or diagonal paths begins with a basic line and advances to more challenging forms back, front, top, bottom, right, left, etc.). 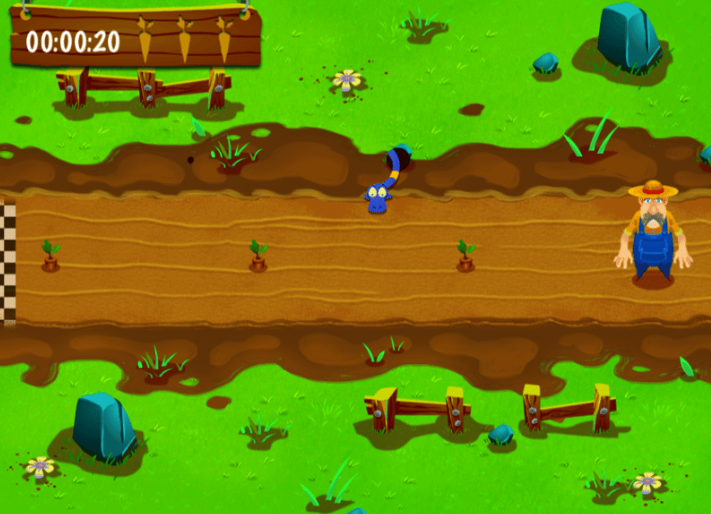 The Farmer has to move along the path and pick up carrots avoiding collisions on the boundaries. The teacher/therapist can adjust the difficulty level by enabling the appearance of obstacles in the form of snakes and worms as well as by changing the width of the path. This game invites children to simultaneously combine several skills including attention, the ability to coordinate properly their hand movements and react quickly to avoid obstacles when needed. At the end of each game, the players have the opportunity to check their mistakes and try to do better, thereby improving these skills gradually.